A quick, easy and convenient way to make your first gallon of fruit wine. 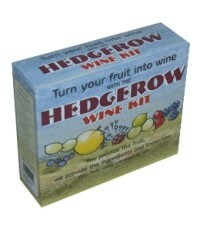 You provide the fruit and sugar, Hedgerow provides all the other ingredients. This amazing little product gets you started in the easiest way possible! Pectolase, Wine Yeast, Nutrient, Citric Acid, Stabiliser, Finings and Oak Barrel Extract are all included you just add the fruit and sugar as required. Recipes and easy to follow instructions are included to make the following wines; Apple , Blackcurrant, Blueberry, Blackberry, Cherry, Crab Apple, Damson, Elderberry, Gooseberry, Greengage, Loganberry, Pear, Plum, Raisin, Raspberry, Redcurrant, Rosehip, Rowanberry .